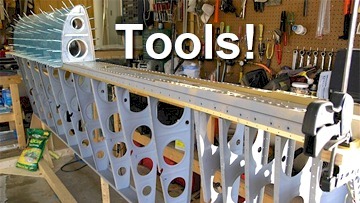 12/1/2006 - Started on the Right Wing! There are 3 sets of these platenuts on the main spar. I countersunk the spar for the flat head rivets that hold the platenuts on, making sure to spot prime each countersink before riveting. I located all of the parts. Now it�s time to think in reverse, since the plans show the left wing assembly. After smoothing the edges of each part which the Scotchbrite wheel and some 400 grit sandpaper, I grabbed the old rattle can primer and put on a thin coat. Not many pictures here, just a lot of cleco moving and drillin' goin' on. When this aircraft is finished, I'm going to have the firmest hand shake in the world. I just realized that it's "tank time". Wow, this right wing is really moving along in comparison to the left. It's time to order some Proseal fuel tank sealant.